The biggest enemy of successful stock trading is something Warren Buffett calls frictional expenses. They represent money you’re shredding without any benefit to you. What are frictional expenses? Commissions and fees are a good example. Learn how to avoid them. One of the simplest screens a short-term trader can run is for volatility and volume. My personal preference is to screen for stocks that have a daily average price range of greater than 5% over the last 60 days, and also have an average volume exceeding 4 million shares per day. I also add in a price constraint, only trading stocks above $10. Based on that criterion, these are the four most volatile stocks with significant volume, providing ample intra-day opportunity for traders. 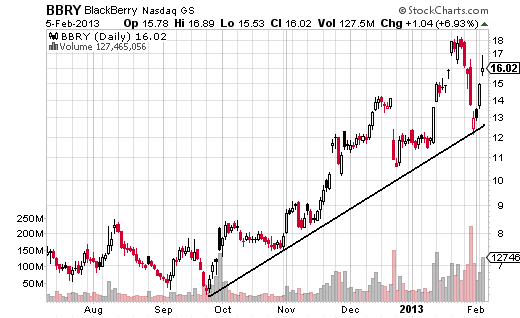 BlackBerry (Nasdaq:BBRY) is prone to having some large intra-day moves. Based on the criterion, this is the most volatile stock of the list. The 60-day average volatility is 6.41% which means almost every day the stock has a significant swing. This has been especially true since the stock has broken out of its sideways lull; July through October 2011 the stock was trendless, and volatility dropped off. In November a surge to the upside signaled a potential change in direction and an escalation in volatility. Right now, this stock is primed for day and swing traders and volume is confirming that – average volume over the last 30 days is just over 70 million shares. That is strongest it has been in some time, and long-term traders should also take note of this strong buying interest. 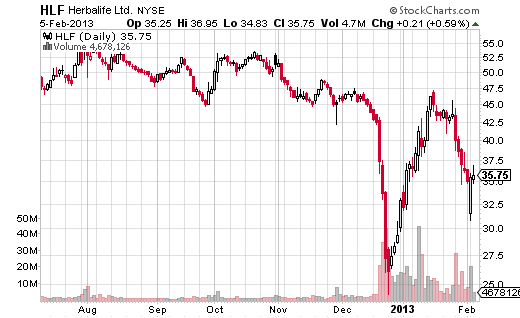 Herbalife (NYSE:HLF) is the next most volatile stock over the last 60 days with a daily average range of 6.17%. The 30-day average volume is just over 15.5 million shares, which is very low historically speaking. This amped up volume, compared to the more usual 1 to 2 million shares in daily volume is presenting some big intra-day moves. After a big drop from near $45 down to $24.24 in December, the stock has stabilized somewhat in the middle, closing at $35.75 on Feb. 5. If this volatility is going to continue, volume will need to stay high. A drop back towards $24.24 is likely to cause a big stir again, as will a rise up towards resistance at $47. 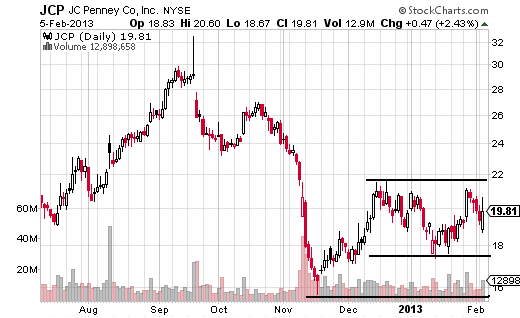 The well-known department store chain J.C. Penney (NYSE:JCP) is posting a daily average (60) range of 5.06%. Since December, range-trading type strategies would have worked well as the stock has moved sideways. While volatility seems high based on the daily range, based on a historical context it isn’t. If the stock moves out of this sideways channel expect volatility to increase. Look for a break above $21.75 or a drop below $17.35 or $15.65. Until that occurs, stick to trading the range as it still presents opportunities. Longer term traders should also keep an eye on these levels, as a breach of any of them is likely to forecast the direction of the next significant move. The 30-day average volume is 8.5 million shares, up just slightly from the volume levels seen over the last two years. VIVUS (Nasdaq:VVUS) has the potential to be highly volatile. Currently, the stock’s 60-day daily average range is 5.53%, yet on two occasions in 2011 the average would have been double that. 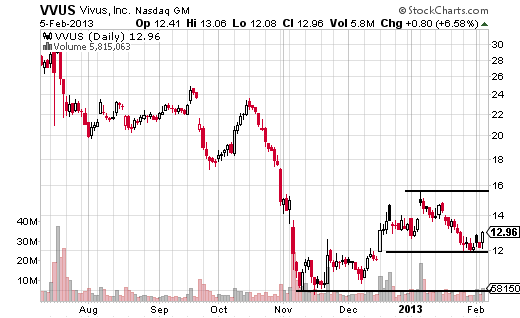 The stock fell from above $30 (July 2011) to just below $10 (November), and has now stabilized between $11.89 and $15.54. A drop below $11.75 will get traders thinking the downtrend is continuing and volatility is likely to pick up further, especially if it starts heading towards the $10 mark. If the stock clears resistance and gets above $15.60, volatility is also likely to escalate. While the stock is still volatile relative to most stocks, I think the real opportunity in this one lies in waiting for a breakout of the levels mentioned. The 30-day average volume is just under 4.8 million shares, which is pretty standard over the last year. Screening doesn’t need to take hours. If you’re a short-term trader looking for volatility, screen for stocks that have consistently big intra-day ranges and solid volume. Day traders can focus on the intra-day moves, while swing-traders may want to wait for a break of a significant price level and the sharp (volatile) ensuing move. Usually these stocks will remain volatile for some time, as they are based on a 60-day average, but if volume begins to dry up or you notice the daily range starting to shrink, abandon the stock and re-run the screen to find a new batch of volatile stocks.